There are any number of really amusing games and competitions which, while costing practically nothing but a little time and trouble to arrange beforehand, may be relied on to make any informal afternoon or evening party go with a swing, to the relief and satisfaction of the host and hostess and the delight of the guests. The absurd nature of many of the contests makes them as entertaining to the onlookers as to the competitors themselves. From the following list of suggestions it will prove a simple matter to choose from four to six games and competitions which will be suited to the size of the room in which the party takes place, and to the company it is required to entertain. For the Zoological Drawing Race two small blackboards and pieces of chalk, or a couple of large wads of white kitchen paper fastened to the lids of dress-boxes and accompanied by two sticks of charcoal, should be placed, a few feet apart, at one end of the room, while a small table, behind which the judge is to be seated, should be arranged at the other, the guests ranging themselves along either side of the impromptu racecourse. Folded strips of paper, each bearing the name of some animal - which may range from an elephant to a goldfish or caterpillar - must be placed in a jar beside the judge, and, to begin the race, two pairs of competitors, each consisting of a man and a girl, must place themselves at the two drawing-boards. The ringing of a handbell starts the race. The two girls dash down the room to the judge's table, where each draws a slip of paper, and, running back with it to the drawing-board, hands it to her partner, who, opens and reads it, and proceeds to draw the animal named thereon. Directly his partner can guess what animal he is attempting to depict, she writes the name on a second slip of paper and tears back with it to the judge. The player who arrives first with the name correctly written wins the heat. The animals must be drawn as large as the board or paper allows, and the liveliest excitement prevails amongst the onlookers during the contest, for it is the object of the artist to give his partner the clue as to the animal he is depicting as swiftly as possible, and a good guesser seldom waits for the entire animal to be drawn, but dashes back with the answer after a single characteristic feature of the bird, beast, or fish has been depicted - the elephant's trunk, the cow's horns, or. rabbit's tail should be enough for the intelligent. When all the heats have been run off, the winning couple should be awarded a small double prize, which, if possible, should take the shape of a duplicate pair of animals. And, with a little manoeuvring with the last two slips of paper, the hostess can arrange that they should represent those drawn in the final contest! A Driving Race -is most successful where space allows of a suitable course, which in a flat might meander down the corridor and round one or two rooms opening off it, instead of down a single room. 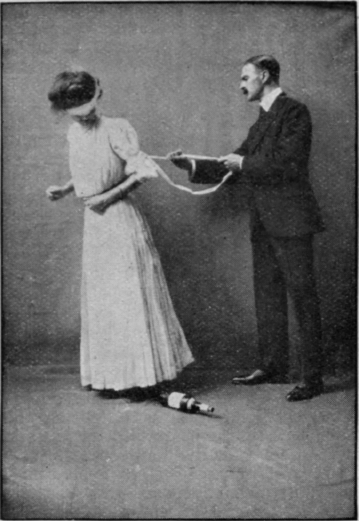 A dozen or more empty wine-bottles must be arranged in a zigzag course, in and out of which each pair of competitors - the man driving the girl blindfold with a pair of ribbon reins - must travel, the players who overturn the fewest number of bottles being declared the winners. The Advertisement Guessing Game is a most amusing one, in which people of very varying ages will enjoy taking part, old ladies and gentlemen entering into the fun with as much zest as their grandchildren. The hostess must collect from twenty to thirty familiar advertisements, such as are well known to every one of us, cut from newspapers or the advertisement pages of the magazines, or included with household packages such as soap; and having numbered each one and noted it against a similar number on a reference card, she must cut out all names and leave only the pictures. Wording such as "Won't Wash Clothes" or "Matchless for the Complexion" may be left, however. These pictures must be pinned up all round the room, fastened to walls, screens, and curtains, before the guests arrive. To begin the game, each guest is given a card, numbered to correspond with those on the advertisement pictures, with a small pencil attached. The competitors, having written their names at the tops of the cards, proceed to rack their brains to remember the names of the maddeningly familiar advertisements, which, as a rule, entirely escape them in the excitement of the moment, especially if the hostess has chosen several pictures advertising different makes of the same article, such as cocoa or soap. When the competitors have filled in their cards to the best of their ability, they are exchanged, and each one corrects her neighbour's card from the list read aloud by the hostess, a small prize being awarded for the best. Tailing the Manx Cat is an amusing blindfold game. The Manx cat - without a tail! - is cut out of white paper and fastened to a blackboard or to the lid of a dress-box, and as many paper tails and pins as there are to be guests are also provided.